When I had my first baby I remember reading lists online and assuming that everything that these so called experts were saying was necessary must have been at least mostly right. I thought – well of course I’ll need all these things, of course I should take him to these special baby rhyme time sessions at the library, of course I need to do what everyone else is doing. When you’re a new mum and the world is full of advice it seems like a safe option to follow the majority, right? As I got into the swing of things with motherhood, I found myself straying further and further from the norm. I found myself listening far more to my instincts – what felt right for us – rather than what every one else was doing or what I had read. There are so many conditioned ideas and myths about babies – what they need, how to treat them, what to buy for them, etc. I’m not saying that there’s one right way with everything with babies, but rather that there are lots of myths that are considered the only/best way and we have found that they’re conditioned ideas. 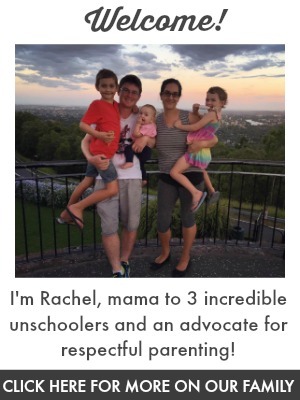 Ava is my first baby who has been parented fully respectfully from birth and ‘unschooled’. It might sound a bit odd to think of unschooling a baby but schooling isn’t limited to schools. Babies deserve respect, freedoms and trust as well! It’s been so beautiful watching her grow without the limiting ideas that guide life with a baby for many people. With Ava (and indeed all my children) autonomy with sleep started from birth. Forced self-soothing is such a fallacy and babies are meant to regulate their own sleep in their own time. I was fortunate enough to come across information and people advocating against sleep training before I even had children. Ava has always slept when tired and sleeps with us in the family bed. When babies sleep autonomy is respected it’s so much less stress all round. No one can force someone to sleep even if we wanted to. This was one myth I always intuitively did not listen to but now even moreso. In a world of play pens and ‘baby and toddler areas’ and a general consensus that babies should only explore areas separate to us, I felt a bit lost. Now I’ve realised how freedom begins at birth. Ava generally explores everything with us and we are there to keep her safe but don’t assume she won’t know how to navigate things. Babies are so capable! We just have to step back and give them the freedom to test their own limits. Of course we keep babies safe and supervise them but so many parents limit their baby so much because of fears. Babies are not able to trust themselves without being given the opportunities to try. Babies are washable and robust, they can handle dirt and water. Confidence comes with practice and mastery of our bodies – babies included! Let them climb and balance and engage in risky play. Babies and toddlers need and deserve our trust. They really are capable of so much and the only way for them to determine their limits is by allowing them to feel and test them. Autonomy with food began with feeding on demand for Ava and continues with allowing her to feed herself solid foods. As parents we of course choose the foods babies can eat but they can feed themselves and eat when, what and how much they want. In the absence of medical issues, babies don’t require pureed food. Baby led weaning was something I dabbled with, with my older two but I always felt pressured to feed them because they ate less than their friends at the time. What is ‘funny’ in hindsight is seeing how much eating and their relationship with food has changed over the years and how much better it has been as they have had control over their eating and are involved in the purchasing and preparing of food. Ava has been fortunate to have that from the beginning. Ava didn’t start eating solids until ‘later’ and had a much longer tasting period and I’m thankful she got to lead her own food journey. I feel that respecting her autonomy will help form healthy habits as she grows. I’ve already shared about how children don’t need teaching as we know it and babies are no different. I know with my older two I felt like I needed to be really intentional about helping them learn. What I realised more and more as how much curiosity is very much all that’s needed. Babies are tiny scientists. The way they interact with the world is quite literally a scientific experiment. We can keep them safe and help them explore the world without force or expectations. Babies and toddlers definitely do not need to be made to learn. Many experts are now cautioning against even common practices like ‘tummy time‘ and recognising the innate abilities of babies. “Children are born passionately eager to make as much sense as they can of things around them. If we attempt to control, manipulate, or divert this process.. the independent scientist in the child disappears.” – John Holt. I adore watching Ava explore the world around her freely. The older children around her including her big brother and sister are always keen to help her too. She’s always so inquisitive and her attention is often caught on things for such a long time. I think it’s really important for babies to have open-ended play with no expectations. Babies and toddlers are just like every other human and while learning new things they make mistakes. It’s not our job as parents to stop them from making little mistakes. Of course, if it’s a safety hazard, we protect them. But babies learning to walk are going to fall. Toddler testing their limits and balancing and going to make mistakes. Little one’s playing and running are bound to bump into something eventually. We don’t need to micro-manage them or dictate their limits – they’re already learning themselves in the most meaningful way. Adults telling them to stop or be careful are only getting in the way of their learning process. Early on in my motherhood journey I really felt like I needed to buy so much stuff even for infants. Particularly ‘just in case’. I don’t think there’s a universal amount or list of things babies need but I know for sure babies need a whole lot less than what is marketed. With my first born, our beautiful nursery room never got used because he slept in our bed. The pram we bought gathered dust as I wore him everywhere. I found myself questioning what babies really need and what really helps us feel connected. The obvious issue here is that not all babies are the same and just like with schooling and parenting, mainstream concepts aren’t always best. Common doesn’t equate to what children need but often are more about what is convenient for adults, marketable or even what was once thought to be best – outdated assumptions. Other than a car seat, a wrap and a couple of hand me down toys and clothes, we really didn’t get anything for Ava. So what worked for you? What conditioned ideas or myths did you forego? Yes to all of this! Although I have wobbled a bit over the years about other people’s expectations and dire predictions, on the whole I have trusted my babies to learn and grow without prodding and met their needs without fear of spoiling them.. When people think they are remarkable in any way I always think that this is how all children might be if they were allowed to unfold in their own way, and gain confidence in themselves. They really are so capable, and hard wired to learn how everything works so they can be part of it all!